In the last couple of months, a few of my friends have moved to Android from iPhones. Some of them reached out to me on advice on devices and apps they should install on their new phones. The Android app ecosystem is pretty rich and while there are a bunch of apps that can replicate the functionality of iOS apps, there are a lot more that I find interesting because of how they leverage the unique strengths of the Android platform. I won’t mention the basic apps that I use like Foursquare, Flipboard, GroupMe or the Google apps like Maps and GMail that you can pretty much get on either platform. This post lists some of the apps that I use that make me a big fan of the Android platform. One of my favorite parts of Android is how applications interplay with each other. The music experience is a great example of this. 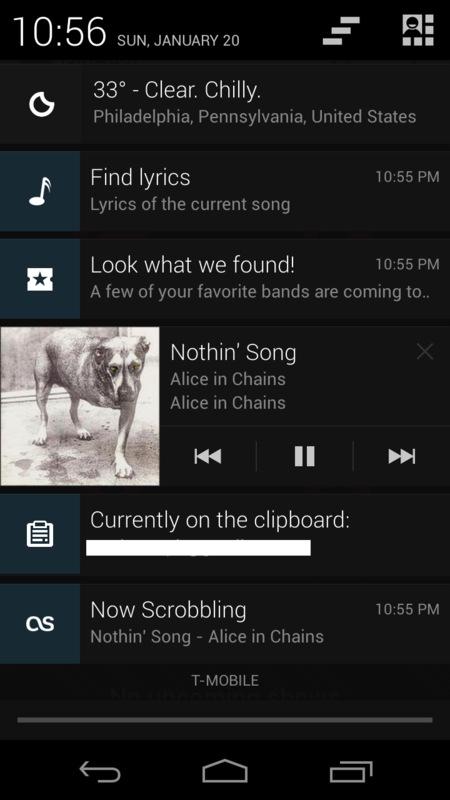 I can control song playback right from the notification shade (Rich Notifications ftw). Additionally, as I play a song, Last.fm scrobbles the song to my Last.fm account. Additionally the LyricsPlayer app offers me a one click link to the lyrics of the song currently playing while Gigbeat searches for upcoming tour dates for the artist. I really love the Android camera app, it was fine before but the recent addition of PhotoSpheres has me completely hooked. I feel it captures the essence of an event or a location so much more. Take a look at my PhotoSphere of the Venetian hotel in Las Vegas when I was there recently for CES (click on the image for the PhotoSphere). Again, like music playback, taking photos sends a system level event in Android. This enables apps like Dropbox and Google+ to allow instant photo upload services that are pretty useful. I haven’t manually uploaded pictures from my device in ages. Whenever I am ready to share my pictures or view them on a different device, they are just there. The official Flickr app for Android is pretty mediocre but if you use Flickr, Glimmr for Flickr is an excellent replacement. The Android address book (recently renamed to the People App) is really remarkable. It allows applications to annotate user data on the address book with additional information. For example, the LinkedIn application automatically sets a contact’s most recent job title right in the Contact details view. 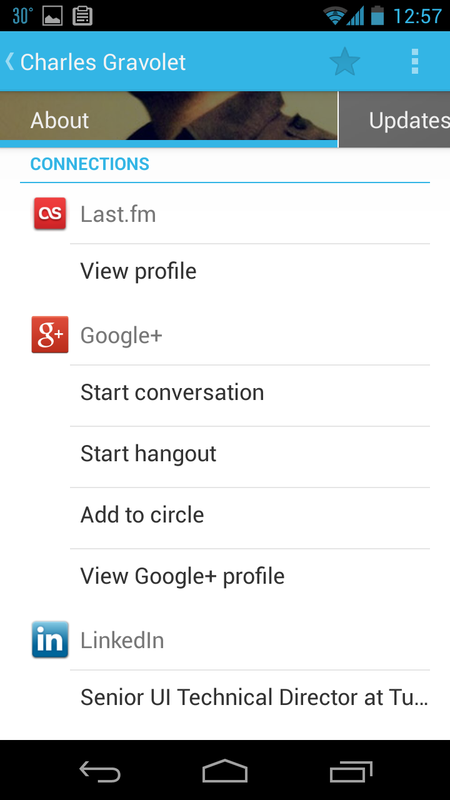 Similarly Last.fm synchronizes your contacts with their Last.fm profiles. The people app also allows applications to publish recent status updates right to the app that is available in the contact details as well. This feature is kinda nice, though its a little buried so I don’t use it as much. There are a couple of apps on the Play Store like Current Caller Id that show contact social updates when they call, but they don’t tap into the contact app data. Hopefully the native dialer app will use this data in a future version of the OS. Android doesn’t come with native Facebook or Twitter integration, but you can get Facebook updates in your People app using HaxSync. A big difference between Android and iOS is that Android devices do let you browse the local file system as well as create folders and files there like a regular computer. You can browse the folders on your PC when the device is connected, but you can also use apps like Astro File Manager to browse the local file system. Another pretty useful app to browse your phone’s content is AirDroid that lets you connect to your device wirelessly as well. The biggest thing I use local file systems for is for auto syncing certain folders among my different devices via Dropbox using DropSync. For example, I have one “Wallpaper” folder that syncs across my Mac, tablet and phone. A different app, the Wallpaper changer, then automatically swaps out my wallpapers once every few hours (again, unlike iOS, Android has a wallpaper api). I also have a dropbox folder called currently-reading that has a bunch of pdfs that sync with a folder my pdf-reader app uses as a source for readable files. Location based information with FieldTrip: Love this app, it indexes a bunch of news and information against location points and shows them when you are around. I use it more when I am traveling to find random interesting trivia. Twitter with Tweetdeck or Falcon: Falcon is the new kid on the block for Android Twitter clients, and its pretty nicely done, but I am still stuck on Tweetdeck for Android even though it hasn’t been updated in ages. The fact that it polls for Twitter data in the background means I never have to hit “load” on the app. Its pretty nice and minimal. Managing Podcasts with DoggCatcher: Lots of features and no need to sync to a device. Never had any trouble with it. Browser: Chrome / Firefox: I like Chrome on my phone but lately have been trying Firefox and it almost seems faster than Chrome at times. I feel the Firefox UI has a little bigger tappable buttons so it seems a little easier to use, it also has a sync across devices feature and allows for plugins! Keyboard: I am currently running Swiftkey Beta for Android. Its really well done and I do enjoy using it. Additionally I have been using Google voice a lot for dictation and it works surprisingly well. Bonus points for it working offline. The DoubleTwist Alarm app is my default alarm app. It has some nice features like power nap alarms, etc but I like it mostly for the UI. Thats most of my suggestions. Let me know if there are any other apps that you use that you find really interesting.